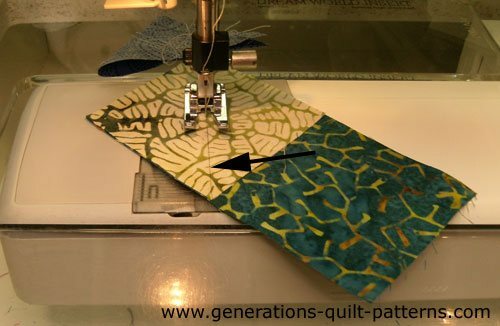 Basic quilting techniques are all that's needed to piece together this elegant bit of foliage! Connector corners, a smattering of paper piecing and a reliable quarter inch seam—seriously—that's it! 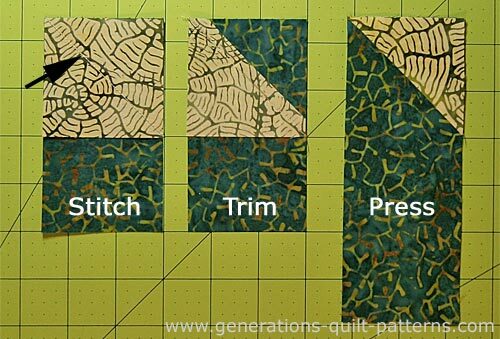 Free download of the paper pieced unit and templates. Cutting instructions for three different block sizes. Step-by-step instructions to complete your Autumn Leaf. Separate instructions to either piece the stem or embroider it by hand. The choice is yours to make. Let's make like a tree and leaf the talking behind. 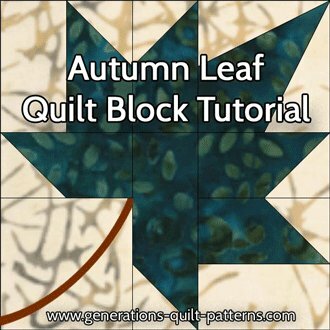 It's time to learn to make this Autumn Leaf quilt block! Further down on this page are additional cutting/piecing instructions if you would prefer to piece (instead of embroider) the stems. Seam allowances (SA) are 1/4" unless otherwise noted. Press units flat first to set the seam. Then open the patches and press again, being careful not to accidentally press a tuck in at the SA. Pressing instructions are highlighted in yellow (like this) to make them easy to find! 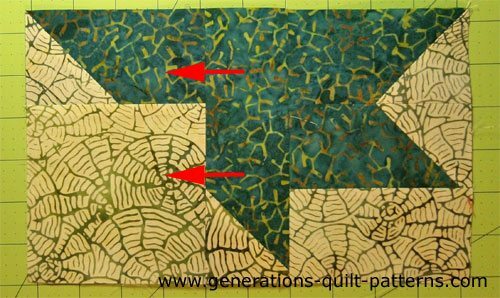 The corner unit of this Autumn Leaf quilt block is also known as the Tippecanoe block. 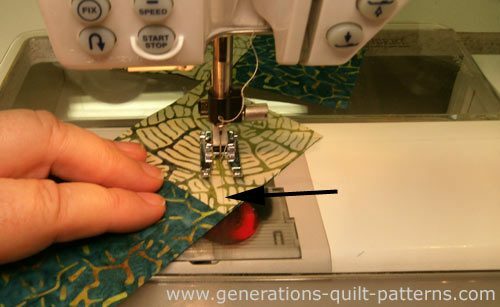 It is paper pieced to eliminate the need for to purchase a special quilting ruler. Choose your Finished Block Size from the table below. 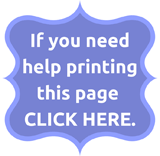 Print 1 each of the corresponding pattern and template page. They are in separate files to economize on paper. 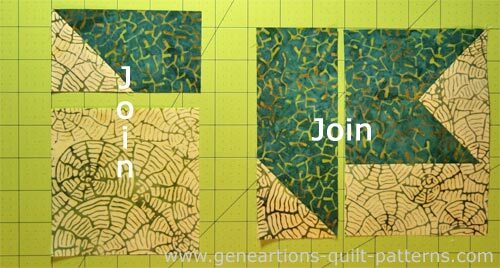 For the 10" finished sample block used in this tutorial, I printed one 4" Tippecanoe pattern and one set of templates. You need the Adobe Reader installed on your computer to print properly. Get it here. A new window opens. Just follow Adobe's instructions for installation. To print the blocks at the correct size, in the Adobe print menu under 'Page Sizing and Handling', set 'Custom Scale' to 100%. each block you make	 2"	 4"	 6"
PRINT 1 set of templates	 2" and 4"**	 2" and 4"**	 6"
**I've combined two different sets of templates on one page to economize on paper. Want more blocks? Then print just the extra pattern pages you need. After printing, cut out a single block and all the templates just past the outside dashed lines. Everything gets trimmed nice and neat later. Find your Finished Block Size in the table below . Cut all the patches in the column underneath it. REMEMBER, use this chart if you plan to embroider the stem. If you would prefer to piece your stem, click here for the substitutions. 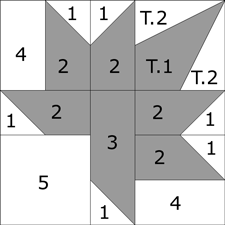 Don't forget to print the templates for the corner block—the Tippecanoe unit. Those links are in the table in Step 1, too. You'll cut Patches 6 and 7 right before you make the unit. Our Autumn Leaf is all about those pointy points. Choose fabrics with good contrast so they don't get lost. In the chart below I use BAC for background fabric. 1	 BAC	 6	 1 1/2"	x	1 1/2"	 2 1/2"	x	2 1/2"	 3 1/2"	x	3 1/2"
2	 Leaf	 5	 1 1/2"	x	2 1/2"	 2 1/2"	x	4 1/2"	 3 1/2"	x	6 1/2"
3	 Leaf	 1	 1 1/2"	x	3 1/2"	 2 1/2"	x	6 1/2"	 3 1/2"	x	9 1/2"
4	 BAC	 2	 1 1/2"	x	2 1/2"	 2 1/2"	x	4 1/2"	 3 1/2"	x	6 1/2"
5	 BAC	 1	 2 1/2"	x	2 1/2"	 4 1/2"	x	4 1/2"	 6 1/2"	x	6 1/2"
Unfinished Block Size	 5 1/2"	 10 1/2"	 15 1/2"
Grid Size	 1"	 2"	 3"
On the back of all the #1 squares, draw a diagonal line from corner to corner. (Black arrow points to it in the photos below.) I've used my favorite Bohin mechanical chalk pencil. The line stays consistently fine. Stitch three of the #1/#2 units with the line sloping up to the right and two more that slope up to the left. Repeat for the remaining #2s and the #3 patch, with the diagonal line sloping up to the left. The diagonal slopes up to the left on the #3 patch. Trim away the excess #1 fabric a quarter inch away from the seam on the side closest to the corner (below, middle). Repeat for all the pairs. Press the remaining #1 patch towards the outside corner. Black arrow points to the stitched line. the two left units are a #1/#2 with the stitching sloping up to the right—remember you need two that slope up to the left and three that slope up to the right. On the right end is the #1/#3 unit. Select two pairs of left and right facing #1/#2 units. With RST stitch each pair together as shown. Press. To distribute the bulk from the connector corners, I choose to press these joining seams open. The final choice, as always, is up to you. With RST, attach a #4 rectangle on the left side of one of these new #1/#2 units and on the right of the other. Press with the SA toward the #4. With RST, join the remaining #1/#2 unit to the top side of the #5 square. (below, left), pressing the SA toward #5. With RST, join the #1/#3 patch (long skinny rectangle combo) to the long edge of the #1/#2/#4 patches(below, right), pressing this SA toward #1/#3. Press the SA in the direction of the red arrows (above).